Decluttering your home prior to your move is one way to make moving day that much easier for yourself. Not only do you save time by not moving unwanted items, but you cut down on unpacking time as well. Need help getting organized? Read on to learn how to declutter your home in no time! The idea behind cleaning and organizing your home pre-move is simple: you're eliminating all the items from your life that you no longer need but may have slowly collected over the years. You don't want to pack useless things and waste time, space and manpower on moving day, so remember to ask yourself one thing while you declutter: Do I really need this? TIP: To save on time, you may want to consider decluttering while you pack. It may seem like it's taking longer, but remember, you're completing two tasks at once. The easiest way to take on clutter is to do it systematically from room to room, just like with packing. Start with the least used rooms first and work your way through your home, making sure to decide what to keep, give away, store and toss as you go along. Clothing has a tendency to pile up over time, but it should also be one of the easier decluttering tasks on your list. You probably won't be taking all your furniture with you when you move locations. Another simple way to cut down on your moving load is to eliminate those larger pieces of furniture you no longer use, or don't plan on using in your new home. Junk drawers are yet another typical area you will need to declutter before your move, but it's also one of the more tedious tasks on your list. 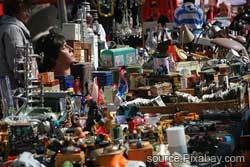 The thing to remember here is what you should be keeping in mind during the entire decluttering process: Do I really need this? If you haven't touched some of the items in your junk drawers in months, odds are, you probably won't miss them. Closets are often another neglected space in your life that needs a going through. Chances are yours are full of items you've unknowingly forgotten about, like unwanted presents from distant relatives. As with all the other locations we've already explored, choose and sort what needs to be kept, stored, given away or trashed. Don't forget to devote some time to those old tax forms, pay stubs and classic novels you have laying around the house. Make sure you go through your food pantries and medicine cabinets on the hunt for any expired items that can be thrown out. Once you've gone through the items in your home and decided what you plan to keep, you can make even more cuts and choose what can be put away if you choose to rent a storage unit (or have some garage space at a family or friend's house!). Now that you've successfully decluttered your home, you need to decide what to do with all the items you won't be taking with you to your new location. You have several options here depending on the condition and worth of the items you no longer need. Follow these steps and you will have successfully decluttered your home (and your life). Just in time to get an accurate quote from a moving team near you.